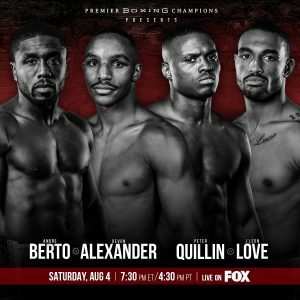 This Saturday night, on August 4th, former welterweight world champs Andre Berto and Devon Alexander will mix it up within the square jungle in a 12-round main event. The undercard of the fight features former middleweight champ Peter Quillin vs. contender J’Leon Love in a super middleweight bout. The event takes place at the Nassau Coliseum in New York and will be televised live by FOX. First and foremost, let’s sample the undercard before the main event. Peter Quillin vs. J’Leon Love (Super Middleweight Division). At thirty-five- years of age, the former WBO middleweight world champion, Peter “Kid Chocolate” Quillin is chomping at the bit for another world title shot. A shot and prospect which he believes is potentially within touching distance. However, he first needs to eradicate his opponent and younger contender, J’Leon Love, from a long line of rapacious super middleweight fighters within a rough, tough and dangerously competetive division. Both Quillin and Love’s professional records are blemished with a loss and draw a piece, and both men will be more than prepared to rage against the tide and be dragged into deep waters; dissolving all strategic-game plans, scrapping it out in a brutal tear-up in order to advance to the next phase of their careers and compete at the top level for a super middleweight title. Until 2015, Peter Quillin was ploughing his way through middleweight boxers, accumulating and notching up an impressive score of 23 knockouts on his professional record. However, since suffering a vicious first-round TKO at the fast-flurrying, lethal hands of Daniel Jacobs back in 2015, Quillin began re-scaffolding his boxing career, and in 2017, he fought for twelve rounds and earned a unanimous decision against Dashton Johnson. Now, “Kid Chocolate” seems raring to go and ready to steamroll his way to victory against the (24-1-1) J’Leon Love. But can he achieve it? Can Quillin, at 35, return to the sport after a hefty 21 month lay off, only to come back in heavier weight class and present a challenge to the top, youthful, title-hungry super middleweight lions? Well, all will be revealed this commencing Saturday night, where a cracking night of boxing should be on the cards! The former Olympian, sports a professional career of (24-1-1) – a fairly decent record with its sole defeat coming from a the Rogelio Medina fight, where a steely left hook rendered Love out by the eight count. However, this fight is a “must-win” if he is to be thrown into the blend of fighters that present a serious threat to the division’s reigning champions, Groves (WBA), Benavidez (WBC), Ramirez (WBO) and Uzcategui (IBF). If so, J’Leon needs to execute his game-plan with precision and effect; deploying and detonating with hard, clean-crisp punches and convincingly winning the bout to aid his ascending climb on the competitive super middleweight ladder. This weekend, we’ll see if Love has the skill, determination and calibre to be regarded as a genuine contender that possess champion material. The main event will showcase Devon Alexander vs. Andre Berto. The former two-weight class, unified world champion, Devon Alexander – a man whose held the WBC and IBF light welterweight titles as well as the IBF welterweight belt, will trade leather against the two-time former welterweight world WBC, IBF and WBA champion, Andre Berto. Berto will clash with the No 4 ranked IBF, welterweight contender in a fight (if he’s successful) that will potentially hurl him back in contention with the division’s elite welterweight warriors. Let’s take a preview and analysis of both men going into the bout. Devon Alexander “The Great” (27-4-1) needs to be sharp and slick in this fight when utilising his solid three punch combinations. It’s clear that Alexander is capable and prepared to stand toe-to-toe and involve himself with terse and brutal, “fighting in a phone booth” slugfests – his battle against Ortiz springs to mind. However, “The Great” should get behind his jab, set traps and fire “in and out” with poised, venomous shots that rattle and breakdown his opponent. With the No. 1 slot vacant for the IBF title, Alexander, absolutely needs to make this one count and do it in style, too if he’s to knock the top welterweight dogs from their championship spots. Andre “The Beast” Berto – with 36 fights, 31 wins and 5 losses in his repertoire; Berto should be licking his lips at the prospect of causing an upset by defeating the bookies favourite in this contest. If “The Beast” emerges victorious as the underdog going into the fight, then it would certainly raise his stock and add further spice to an already fiery division. But only time will tell. For this fight, both men should prepare for vicious trades within an ugly, Gran Prix paced scrap that displays fast hands, rapid combinations and hard, solid punishing blows. 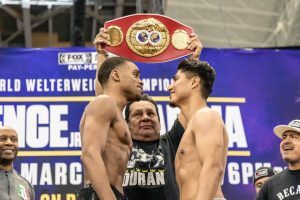 Both fighters can’t afford to get caught cold and both need to be vigilant and wired-up, yet capable to dispatch a dynamite, powerhouse ferocity that explodes “at the ready.” Essentially, a convincing win is definitely required from one of the two boxers. But who wins and who goes away with second prize from a two horse race?